If a total kitchen demolition sounds like a daunting, expensive process, let us show you a new way. We specialize in our exclusive Forefront™ Cabinet Remodeling process that will give your space a new look and feel without demolishing your existing kitchen, and without sacrificing quality. We can also add new, custom designed cabinets and modify existing kitchen cabinetry as needed to make your vision a reality. We only utilize the finest solid wood materials to give you the look you desire and functionality with our custom kitchen storage solutions. Our approach offers the same options you get with designer built custom cabinets, enhanced by the convenience of kitchen refacing. Guiding you through the front end of the kitchen design process ensures the final product matches your expectations. 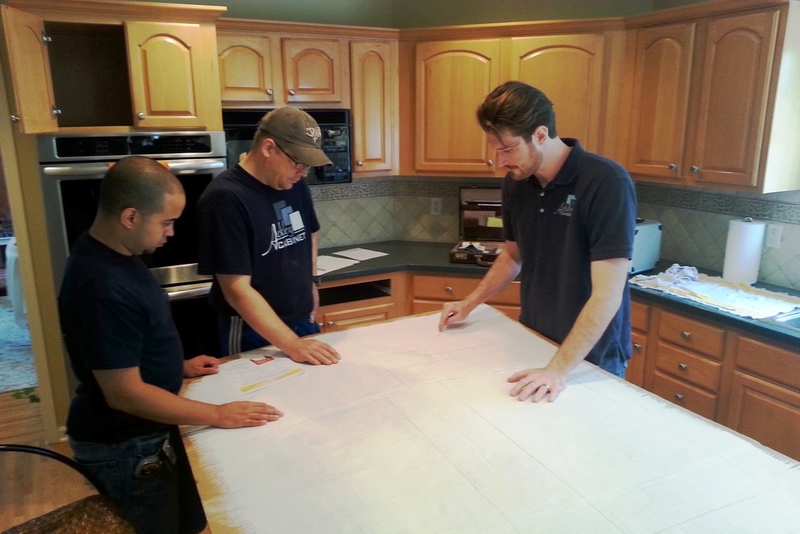 And all of our team members are extensively trained to deliver high-quality craftsmanship to our clients. Why let your solid cabinet boxes end up in a landfill when you can choose to remodel? We use solid wood sourced sustainably from the USA and Canada. All of our doors and drawers are hand made in the USA. Enjoy the convenience and minimize the mess with our Forefront™ process. You will have full access to all kitchen appliances and plumbing during the process. Use your kitchen every night and never have to live without. Established in 1971, our track record demonstrates a commitment to high quality woodworking and client satisfaction, with hundreds of kitchens transformed to date. Enjoy the benefits of a local and family based business. We take pride in guiding our clients through the remodeling process. From door styles and moulding details, to custom finishes and layout enhancements; we want to ensure your kitchen is enjoyed and admired for many years to come. For over 40 years, Ackley Cabinet is an award winning local expert for kitchen design and our unique custom cabinet remodeling process. We proudly service Fairfield County, Connecticut and Westchester County, New York; including Ridgefield CT, New Canaan CT, Westport CT, Greenwich CT, Darien CT, Newtown CT, Wilton CT, Bedford NY, Chappaqua NY, and Cross River NY. Looking for more kitchen design inspiration? See more of our client's visions brought to reality. Meet our accomplished team who will be happy to help bring your dream kitchen to life. Learn how our innovative method offers you a convenient way to get a custom kitchen.